The Pregnant Husband: 8w6d: Twins First Ultrasound Photo! 8w6d: Twins First Ultrasound Photo! Well, as we are wrapping up our 8th week of pregnancy, what better time than now to debut their first photo taken on October 9th. The above diagram gives you and idea of the key body parts and the position and placement of the twins inside Mom's womb. Since we are new to this whole baby business, having a simple description like the above has helped us tremendously as the "real" photos early on in the pregnancy are blurry blobs that someone, like their own doctor writing, only doctors can decipher. Isn't he beautiful? Well, I told you they looked like blurry jelly beans. But be not mistaken, this critter is beating his little heart out (twice that of Mom's heart beats per minute). This was taken 10/9/13 - the same day as the wife's birthday! No better lifetime present than these two babies! On this day, she was 41 days pregnant at 5w6d. The gestational age of Baby A here is at 5w6d. So just on target. His CRL measurement was 2.9cm (this is the standard measurement from crown to rump on how they determine the baby's growth rate). And the flickering in the middle is his heart already beating away! Baby B here came in measuring at 3.22 mm CRL with a gestational age of 6w0d, also right on growth target. Team Baby B here is the one we have been giving some extra prayer power as she is smaller than Baby A and needs all the lovin' we can send her way to catch up. This first trimester is the most critical time to do so! Nutrition is vital in this stage as today we are on our 62nd day of pregnancy or otherwise referred to as 8w6d (in English meaning eight weeks and six days pregnant). The wife has lost one lb. in weight due to her dislike of her new bland eating regimen. She's gotta gain at least 30 to 40 lbs during her pregnancy. If that were me, I would have obliged quite some time ago already! Her hormone levels are normal at 1,719 for estrogen and 39.8 for progesterone. These two "pregnancy" hormones are key in her body's ability to be able to keep nourishing and growing the twins. So her youngin' body is taking these two additions in her uterus with stride. Isn't that the most incredible photo for the ages? Baby A is on the left and Baby B is on the right. 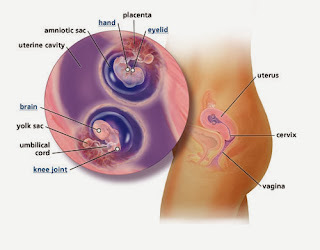 The black circular thingies you see are called the amniotic sacs. That is where each baby is living and being housed, fed, and protected. The pinto beans you see inside the black circles are the actual babies themselves. And hopefully, judging from today, they won't come out with pizza heads since wife has to gain weight pronto; she indulged in a heavenly slice of Costco pizza (a no no given the processed tomato sauce and pepperoni). I wanted to share a special write up I've come across from an unknown author that hit home with our current journey. It captures the essence of how blessed we feel to be living these days. There are men that become fathers without effort, without thought, without patience or loss, and though they are good fathers and love their children, I know that I will be better. I will be better not because of genetics, or money, or that I have read more books, but because I have struggled and toiled for these twins. I have longed and waited. I have cried and prayed. I have endured and planned over and over again. Like most things in life, the people who truly have appreciation are those who have struggled to attain their dreams. I will notice everything about my twins. I will take time to watch my children sleep, explore and discover. I will marvel at this miracle every day for the rest of my life. I will be happy when I wake in the middle of the night to the sound of my kids, knowing that I can comfort, hold and feed them and that I am not waking to take another temperature, pop another pill, take another shot or cry tears of a broken dream. My dream will be crying for me. I count myself lucky in this sense; that God has given me this insight, this special vision with which I will look upon my twins that my friends will not see. Whether I parent a child or my beloved wife actually gives birth to or a child that God leads me to, I will not be careless with my love. I will be a better father for all that I have endured. I am a better husband, a better uncle, a better son, neighbor, friend and brother because I have known pain. I know disillusionment as I have been betrayed by my own body. I have been tried by fire and hell many never face, yet given time, I stood tall. So now, when others hurt around me, I do not run from their pain in order to save myself discomfort. I see it, mourn it, and join them in theirs. I listen. And even though I cannot make it better, I can make it less lonely. I have learned the immense power of another hand holding tight to mine, of other eyes that moisten as they learn to accept the harsh truth and when life is beyond hard. I have learned a compassion that only comes with walking in those shoes. I have learned to appreciate life. Yes I WILL be a wonderful father. Why wouldn't I be? I have been preparing for this role my entire life. It is and will be one of my life's biggest fulfilling prophecies of giving back to the world the greatest love of all. The unique, special, and most precious thing in my own life - the love my wife and I share with each other. A legacy onto the universe to continue that circle of love for all eternity, for love knows no time, space, or boundary. Love just is.